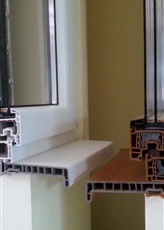 Interior sills are intended to cover the edge of the wall from inside the room. One of its main purposes is to stop any spilled water from condensation on windows or other origin. Produced by resistant PVC material. They have profiled hollow shape, with many voids, which achieve exceptional insulation properties. Interior window sills are easy to clean and maintain, resistant to detergents, abrasion and scratching. No water absorption and water rings that can arise from wet pots or put bowls can easily be cleaned. Moreover, they are insensitive to heat.